Need a gourmet pick me-up? Our range of gourmet soup flavours make for a deliciously uplifting snack. 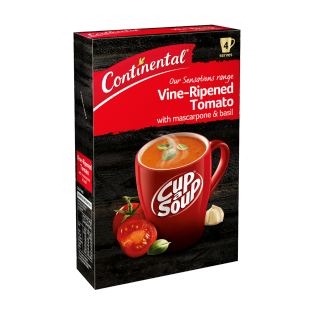 Try Continental Sensations Vine-Ripened Tomato with Mascarpone & Basil! When reconstituted: vegetables [tomatoes^ (83%), onion], skim milk, thickener (1412), mascarpone cheese (3%) (milk solids, cream, cheese cultures), sugar, salt, cream, vegetable oil, creamer [vegetable oil (contains soybean derivative), glucose syrup (from wheat), milk protein, mineral salts (339, 450)], wheat flour, yeast extract, basil, natural colours (paprika, carmine), maltodextrin, natural flavours (contain soybean and milk derivatives), garlic. ^ From responsibly grown tomatoes. Allergens:Contains milk, soybean and wheat products. Made on equipment that also processes products containing peanut, egg, sesame, fish and crustacea. This soup is the best in the range. Creamy and delicious.